The worn area on the face of the Burst while being played by Paul Warren. “I played very aggressively,” he said. Establishing the provenance of a vintage guitar can be a daunting task, even for a seasoned pro. In the case of one particular 1960 Gibson Les Paul Standard, the investigation unearthed a fascinating story and offers a glimpse into the emerging vintage-guitar market of the 1970s. It’s been almost a quarter century since German college student Franz Josef Dirking noticed a peculiar ad in a newspaper. “1950s Gibson Les Paul guitars for sale” it read. After a quick phone call Dirking was driving to Duesseldorf, where the seller turned out to be an underwriting company for British insurer Lloyd’s of London. “They were stolen in the U.K. and recovered in a police raid here in Germany,” the Lloyd’s agent explained of the instruments, which were apparently kept in a shabby closet without cases. 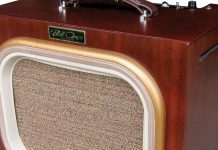 “They’re priced at 50 percent of the insured value.” A deal was made, and 7,500 Deutschmark (approximately $3,000) changed hands in return for the 1960 Standard and a ’52 goldtop. The purchase all but wiped out Dirking’s savings, but he felt satisfied, as vintage guitars were becoming popular, even in Germany. The ’Burst spent most of the next 24 years under the new owner’s bed, taken out only for special occasions. Though he was a bonafide tinkerer, Dirking refrained from modifying the guitar, and started to study vintage Gibsons. 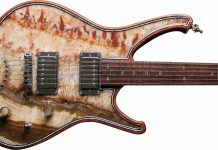 At some point, he showed it to the late Frank “Eff Jott” Krueger, a guitarist and vintage-guitar expert in Berlin who immediately saw that it had a replaced neck. “Gibson workmanship, or Arnold Hoyer,” Krueger told Dirking. “Nobody else can do that quality of work around here,” he proclaimed. Krueger also immediately noticed the fake serial number and replaced pickups. He made a cash offer, but Dirking declined. The 1960 Gibson “Paul Warren” Les Paul Standard. Or is it more proper to call it the second “Peter Green” Burst? Photo by Thomas Willemsen. Paul Warren was something of a wunderkind guitar player in the Detroit session scene, having played on countless Motown hits including the bluesy licks on “Papa Was A Rolling Stone” by the Temptations way before he was old enough to buy a beer in the state of Michigan. He was into the blues and Eric Clapton, especially John Mayall and the Blue Breakers’ “Beano” album, and vintage-Les-Paul-through-a-Marshall roar. He wanted a Burst – bad! The deal was done and Warren took receipt of the guitar, immediately going to work improving on his new main squeeze. He didn’t care for the guitar’s “reflector” control knobs, and replaced them with more-traditional knobs. Shortly after acquiring the guitar, Warren found himself rehearsing with Ray Manzarek’s band, Nite City, at SIR studios in Hollywood. Guitarist/photojournalist Robb Lawrence was head of SIR’s guitar department at the time, and recalls catching wind of a disastrous event during the sessions. The damage was indeed horrific. But Lawrence knew that repairman Yuris Zeltins, at the Blue Guitar Shop, in San Diego, was the man for such a delicate repair. Zeltins used the original fretboard and holly veneer, keeping the feel and look as original as possible. However, no serial number was applied because Zeltins didn’t have a properly sized ink stamp. Warren’s preferences changed, however, and he soon had his eyes on a ’58 Gibson Explorer. After trading his serial number-challenged Burst for it, he named his band Paul Warren and Explorer. The Burst next spent time in the hands of L.A. guitar collector/dealer Frank Lucido. Asked about the trade, Warren remembers that he was very attached to the pickups of his Les Paul, and insisted on keeping them. Lucido liked the Burst, but was “…a little turned off by the wear on the bass string side,” and hastily installed different pickups, accidentally wiring them out of phase. Why the rush? A prominent client of his was to arrive soon and he was shopping for a Burst. In late 1977, after an extended hiatus from the music business and almost a year after being committed for treatment at a mental hospital, the “Green God” was ready to get his musical and personal lives back on track. He relocated to L.A. and soon found his way to the doorsteps of his old pal Mick Fleetwood. In January of ’78, Fleetwood hosted Green’s wedding to Jane Samuels, and shortly after, arranged a very lucrative recording contract for him with Warner Brothers. But Green apparently refused to sign the deal. According to Peter Green biographer Martin Celmins, Green told Fleetwood, “It’s the work of the devil. This is not what music should be.” Still, by 1979, Green’s career was back on track with the release of In The Skies, recorded almost two years earlier. The album was well-received despite the fact Green primarily played rhythm guitar, while his friend Snowy White (Pink Floyd, Thin Lizzy) covered most lead duties. Even after the embarrassing incident with Warner Brothers, Fleetwood remained in contact, and one day took Green guitar shopping. 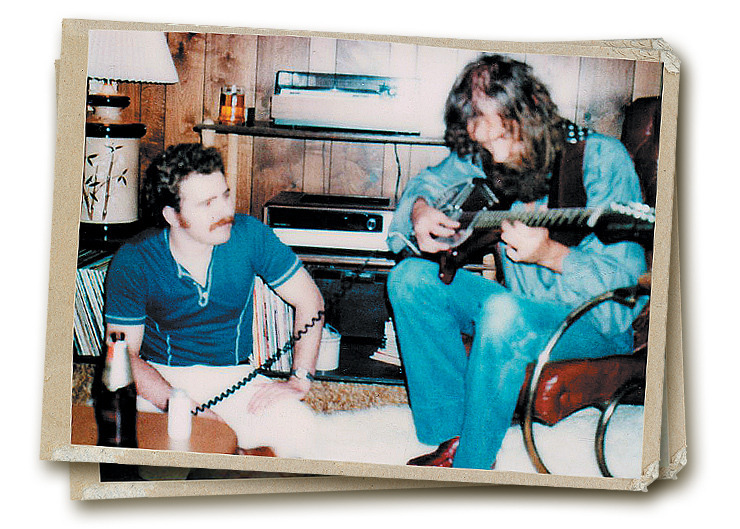 Fleetwood wanted to buy his friend a Les Paul like the one he’d played in Fleetwood Mac. Lucido vividly remembers their encounter. Much to Lucido’s surprise, Green chose the fourth vintage Burst laying around the house – a worn 1960 model with a replaced neck and pickups wired out-of-phase. The extent to which Green used the guitar is not known, but he did pose with it for a promotional photo, probably taken not long after that day at Lucido’s home. In the photo, Green appears to be wearing the same red flannel shirt and light blue T-shirt he wore the day of the purchase. 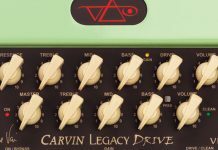 According to Celmins, Green was overjoyed to have the Burst, but not long after acquiring it, handed it to a complete stranger in a hotel elevator, and the guitar ended up in a pawn shop, where it was later recovered by Peter Vernon Kell, a music producer who worked with Green at the time. 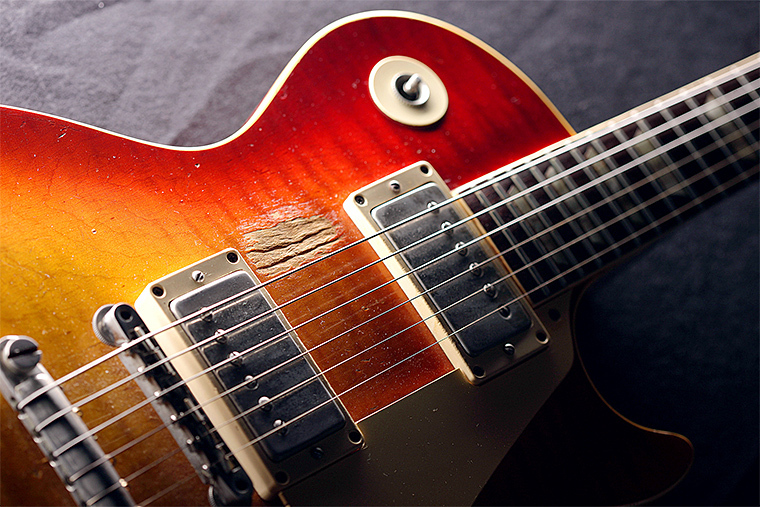 Peter Green’s original 1959 Burst has been at the center of Les Paul Mania for several decades. However, to Peter it was more of a “funny old fuddy-duddy with a neck like a tree trunk”. Photojournalist Robb Lawrence, who took a series of pictures of Warren’s Burst more than 30 years ago, was not surprised that Green chose the 1960 Les Paul, given that he had long admired Clapton’s slender-neck ’60 Burst. So, did Peter Green use the Burst in the late ’70s? Did he record with it? Producer Ken Caillat remembers that the guitarist showed up for an extended, booze-soaked jam session at the Record Plant, where Fleetwood Mac was recording Tusk in ’79. Those jams resulted in the eight notes at the end of “Brown Eyes” and Green possibly used the Burst. What is known is that Green and the Burst eventually returned to the U.K. Over the next few years, Green recorded several more albums in England. British guitarist Ronnie Johnson, who played on some of those albums in the early ’80s, remembers Green playing a similar-looking Les Paul on “White Sky,” but whether it was this particular guitar, he couldn’t say with certainty. 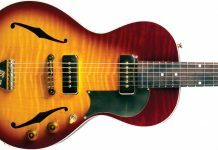 For his part, Lucido recalls an inquiry from a British guitar dealer in the early ’80s regarding the replaced neck of “Peter Green’s Les Paul,” and there was at least one sighting of the Burst in a guitar store in the U.K. So, although there are questions about its whereabouts at certain times of its life, we know that today it rests firmly in the possession of Franz Josef Dirking. In early 1979, Frank Lucido was teaching high school in Downey, California. His hobby was collecting guitars, and he was actively buying, selling, and trading instruments and amplifiers. Rather than guess, Lucido stuffed 31 guitars into his ’71 Cadillac El Dorado and by 7 p.m. was driving through a rainstorm on Mulholland Drive. Upon arriving, he introduced himself and started hauling guitars into the rehearsal house’s large living room. The band was there, except for Stevie Nicks, along with a few other people, including the recording engineer. 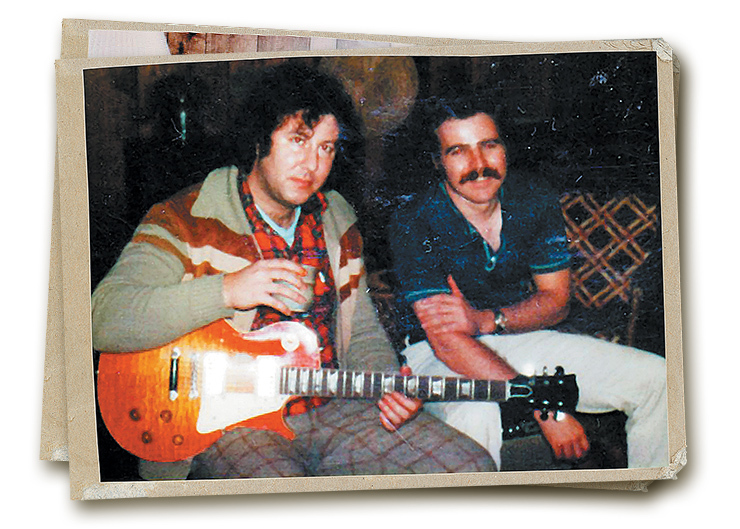 Peter Green test-drives a Les Paul Standard in Frank Lucido’s living room in 1979. Buckingham tested several guitars through a ’59 Fender Twin brought by Lucido. As proceedings wrapped and Lucido was getting ready to leave, he had only three guitars unsold. But Buckingham already had one, which he grabbed to show Lucido. Pointing out that its rewound pickup disqualified the guitar as “real” Tele, Lucido convinced Buckingham to buy the ’51. Price? A then top-dollar figure of $2,000. Lucido then invoiced Fleetwood for more money than he would make in three years as a teacher, and left with only two guitars. A few months later, Fleetwood called again. Mick Fleetwood tries a Coral Sitar in Frank Lucido’s living room. “He wanted to buy a guitar for his old buddy, Peter Green. I’d been a long-time admirer of Peter and was glad to help.” Fleetwood drove Green to Lucido’s home. Unaware at the time that Green’s famous ’59 Les Paul Standard had also been wired out of phase, Lucido was surprised when Green chose the Burst with the replaced neck. 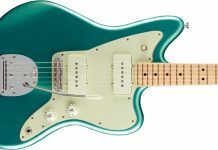 Yes, it was $1,000 cheaper, but Green seemed to genuinely prefer the sound of the guitar. 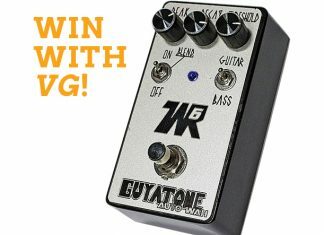 In retrospect, of course, it makes sense given that its tone probably resembled the out-of-phase sound of his first Burst. Later that year, Buckingham called Lucido to acquire a mint 1966 Rickenbacker 12-string he wanted to use on the Tusk recordings, while Fleetwood bought a ’30s Martin 000-28 herringbone and a ’50s, blond D’Angelico Excel. At one point Lucido offered Fleetwood a ’50s Gretsch White Penguin for $1,000 because he knew the Mac used a penguin theme. Fleetwood passed. 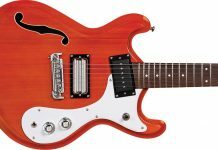 Thanks in large part to the sale of the guitars to Fleetwood, Buckingham, et al, Lucido quit teaching at the end of that school year, and in February, 1980, opened California Guitar, which specialized in dealing vintage instruments. This article originally appeared in VG‘s July 2009 issue. All copyrights are by the author and Vintage Guitar magazine. Unauthorized replication or use is strictly prohibited.